The Battle of Passchendaele is also known as the Third Battle of Ypres and was one of the most significant battles of World War I on the Western Front. It was fought between the Allied Powers and Germany from July 31st to November 10th in 1917. The battle took place close to the Belgian city of Ypres and was a major battle on the Western Front. The goal of the battle was for Allied forces (including: British, Canadian, Australian, New Zealand, South Africa, Indian, French and Belgium) to push German forces out of the area. The Germans had a strong hold of a ridge that overlooked the city of Ypres. British commander, General Douglas Haig, wanted to carry out an attack of the area in the hopes of pushing back German forces and hopefully capturing coastal ports north of the region. Germany had been using the northern ports to launch its submarines that were causing havoc for merchant ships in the North Atlantic, and the Allied forces wanted to end the launching of these submarines. The British attacked the German at Ypres on July 31st, but struggled to make any meaningful gains and both sides suffered massive losses. The continuous fire from both sides and the horrible conditions slowed the pace of battle and caused the battle to create stalemate-like conditions. Therefore, Haig’s campaign on the German position would run into extreme difficulties. The Allied forces would have to contend with the weather and the horrible conditions of the battlefield. For example, rain and its impact on the battlefield would come to play an important role in the overall battle. 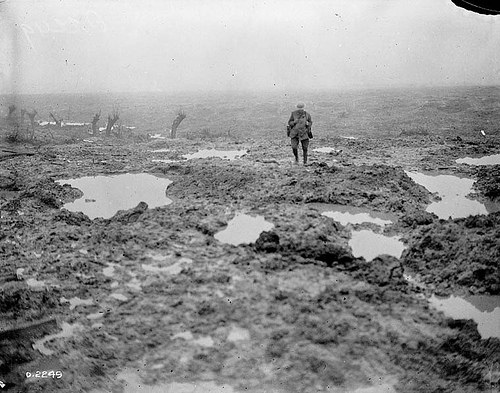 The battlefields of Passchendaele would come to characterize the muddy, terrible conditions that World War I is famous for. The battlefield was littered with craters from artillery fire which, when filled with rain water, created deep pockets of mud that were, at times, deeper than the height of a man. This meant that soldiers killed on the battlefield would sometimes sink into the mud and be lost beneath the surface. As well, attacking soldiers would have to run across boards to avoid becoming stuck in the mud and being vulnerable to enemy fire. The mud made every aspect of life for the soldiers difficult. Soldiers reporting sinking into the mud as they slept, having the mud clog their rifles and having rain and mud fill their boots. The wet conditions created the perfect setting for trench foot, which could cause a soldier to get an infection in their foot. To combat this, the army provided soldiers with whale oil, which they were instructed to rub on their feet. The oil prevented the water from getting to their skin. Eventually, the British would call in the support of Canadian forces which after many weeks of fighting were finally able to capture the ridge at Ypres from the Germans. The Canadians captured the ridge in November of 1917 and the Battle of Passchendaele was over. In total, the Allied forces suffered over 250,000 casualties and the German forces suffered over 220,000 during the battle. In 1918, the Allies retreated from the area when they faced threat of a large German assault. Therefore, many now look back on the Battle of Passchendaele as an example of the waste of humanity in the fighting of World War I.